"China and Russia challenge American power, influence, and interests, attempting to erode American security and prosperity. They are determined to make economies less free and less fair, to grow their militaries, and to control information and data to repress their societies and expand their influence." "China and Russia are developing advanced weapons and capabilities that could threaten our critical infrastructure and our command and control architecture." "China and Russia want to shape a world antithetical to U.S. values and interests. China seeks to displace the United States in the Indo-Pacific region, expand the reaches of its state-driven economic model, and reorder the region in its favor. Russia seeks to restore its great power status and establish spheres of influence near its borders." "China and Russia began to reassert their influence regionally and globally. Today, they are fielding military capabilities designed to deny America access in times of crisis and to contest our ability to operate freely in critical commercial zones during peacetime. In short, they are contesting our geopolitical advantages and trying to change the international order in their favor." "China, Russia, and other state and non- state actors recognize that the United States often views the world in binary terms, with states being either “at peace” or “at war,” when it is actually an arena of continuous competition. Our adversaries will not fight us on our terms. We will raise our competitive game to meet that challenge, to protect American interests, and to advance our values." In fact, China is mentioned in the document 33 times and Russia is mentioned 25 times whereas the bogeyman of Islamic terrorism is only mentioned twice. Recent news out of China as reported by the Global Times, China's English-language edition of the People's Daily newspaper, the official mouthpiece of the Communist Party of China should send shudders through the hallowed halls of Washington. Since the current administration is showing little interest in co-operating with either nation and, in fact, is making significant motions to restrain trade and impose sanctions, the two nations are increasingly being driven into "each others arms" in an effort to create a multipolar world, one in which America no longer has a monopoly on world events. "The armed forces of China and Russia held their 20th round of strategic consultation in Beijing on Wednesday. The two sides exchanged views and reached broad consensus on current international and regional hotspot issues and on further deepening China-Russia military cooperation under the new circumstances. They pledged to firmly implement the important consensus reached by leaders of the two countries, boost bilateral military cooperation and make new contributions to pressing ahead with military strategic cooperation." "Major General Shao Yuanming, deputy chief of staff of the Joint Staff Department of China’s Central Military Commission (CMC), and Colonel General Sergei Rudskoy, chief of the Main Operational Directorate of the General Staff of the Russian Armed Forces, co-hosted the consultation. The two sides indicated that they will firmly implement the important consensus reached by President Xi Jinping and President Putin, further enhance the level of bilateral military cooperation and make positive efforts to help the strategic cooperation between the two militaries to take new steps in the new stage." 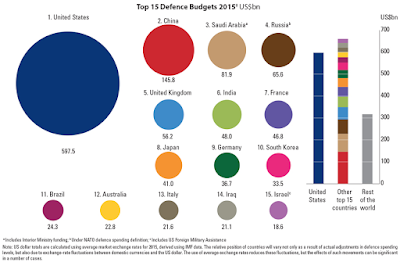 While spending on America's military is nearly three times what Russia and China spend in combination, sometimes you get more for less, particularly in America's highly profitable military-industrial complex. As you can see from these statistics, there is no doubt that a combined Russia - China military would be a force to be reckoned with, particularly in a two-front battle, a situation similar to the two-front reality that Germany faced in 1944. The evolving ostracization of both nations by the United States has the potential to create a unified powerhouse that will make it increasingly likely that the unipolar world of the 1990s and 2000s will come to a painful end. Well written. Thanks. Us military might is insignificant when it come down to nuclear powers. The real and only power the us has is the fragile belief that the dollar has value. If this article is trying to indicate the power of the two Counties combined as allies going up against the US alone well sure, but the article seems to leave out the US allies and what they might bring to the table as well - Britain, France, & Japan. So, I wouldn't assume a victor; although there wouldn't be any victors at that point anyhow. I standing on the middle, when war is going ..
Then lets also add the considerable military mught of Iran and North Korea. Egypt would likely side with Russia has huge military.Also India massive military. World war wont be like the last one on many different levels. List does not go to frigates and powerful corvettes of which Russia and China far outnumber in both firepower and units.